Mâche (also called “corn salad”) is a small, annual salad green that has been cultivated in Europe for centuries. Mâche does not have a long shelf life once it is harvested and is expensive. And, like leaf lettuce, mâche is mild tasting and a wonderful green to introduce to your children. These are great reasons to grow this delicate, nutty-tasting green along with other leafy vegetables. While lettuce seeds and potted seedlings are easily available, mâche seedlings may be difficult to find. Like lettuce, mâche varieties affect leaf size and color intensity. So, consult a seed catalog or visit a seed bank such as Baker Creek in Petaluma (click here for vegetable seed sources). You may start seeds in a flat indoors four to six weeks prior to your projected planting date or direct-seed when optimal (as soon as the ground can be worked, or earlier if you have a coldframe or can protect the tender plants from heavy rain with crop cover). The Sonoma County Master Gardener Vegetable Planting Summary provides additional guidance. Mâche is low to the ground and is a small, loosely-bunched plant that grows in a rosette and should be spaced 2 inches apart in rows. Therefore, plant mâche with your low-growing lettuce in an area that has nutrient-rich soil and is well draining. A raised bed is ideal but, if you have limited space, consider a large pot in the morning sun (be advised that plants will bolt when Sonoma County temperatures rise in early summer). Follow the seed package directions for planting depth and keep the soil evenly moist. When mâche plants have three to four true leaves, thin to 2 inches and, like leaf lettuce, “harvest and thin” as it grows. Because of its shallow root system, keep the bed weeded to reduce competition. In general, cool season crops are threatened by fewer insect pests and plant diseases than warm season varieties. In coastal regions, leafy greens may be affected by downy mildew. Good cultural practices reduce this risk: space or thin to provide good air circulation between plants; allow the soil to dry between irrigations; avoid overhead watering to keep leaves as dry as possible; and remove and destroy any infected leaves. Mâche is used fresh. Pick once the leaves have reached a desirable size. Because of a relatively short shelf life, only pick the amount needed. 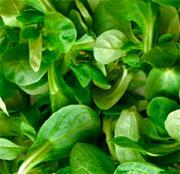 If necessary, store greens in your refrigerator crisper drawer for a few days. “Foraged greens” generally have more nutritional value than lettuce…mâche has three times as much vitamin C and contains heart-healthy Omega-3, for example. Besides using mâche in a mix of greens, mâche can be cooked like spinach and used in soups, sandwiches and stuffing. With mild flavor and tender consistency, mâche and leaf lettuce are a good salad base for stronger tasting and textured ingredients – for example, try them with fresh citrus and avocado, toss with a fig balsamic vinegar and olive oil dressing, and top with crunchy slivers of baked tortillas; or try a mix with halved grapes, spring onions, a grape seed oil and balsamic vinegar dressing, and toasted pecans. If you grow kitchen herbs, use mâche and leaf lettuce as a base for herb salad along with crunchy, seasonal raw vegetables.